Interested in learning more about the individuals who help The Fredericks Company provide exceptional products and services to our customers? Welcome to our blog’s new Employee Spotlight series! This series aims to give our readers a peek at Fredericks’ hard-working team to learn more about their roles at the company and what motivates them to work hard. 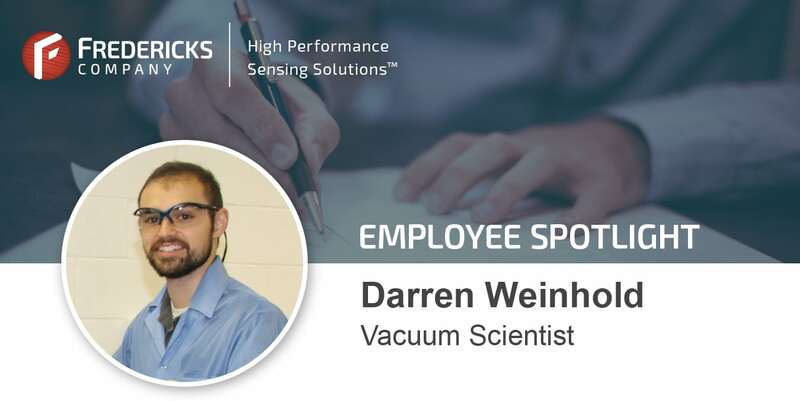 For this inaugural post, we’re putting the spotlight on Darren Weinhold, a Vacuum Scientist who has dedicated his talents to Fredericks for nearly five years. Darren holds a bachelor’s degree in astrophysics from Swarthmore College and a master’s degree in mechanical engineering from Temple University. What is your title and role at Fredericks? My title is Vacuum Scientist. 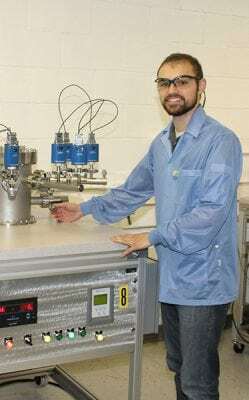 I am responsible for researching and developing new vacuum measurement technologies and helping to bring vacuum measurement products to market. What does a typical day at Fredericks look like for you? Like most, my days at Fredericks are varied. Some days I interface with customers to provide the best solution for their needs or troubleshoot their process. Other days I plan experiments, collect data, and analyze results. Sometimes I work with electrical engineers to provide specifications for electronics or software design to interface with vacuum sensors. I also work with our production technicians to improve manufacturing processes. How has Fredericks helped the development of your career, and what specifically have you gained from working here? Because Fredericks is a great place to learn and experiment, it has been beneficial for my career development. Taking risks and thinking outside of the box is highly encouraged here. There is also a huge emphasis on learning and improving here, and as such, one of the many great benefits of working at Fredericks has been financial support for my M.S.M.E degree from Temple University. What has been your favorite project at Fredericks? That’s a difficult question as there are a lot to choose from. Probably my favorite has been designing new vacuum stands for the testing of our vacuum sensors. It’s an important step in our stringent quality control process and being able to improve the flow of materials and finished goods through our facility is important to providing vacuum measurement solutions at a competitive price. What are you looking forward to accomplishing at Fredericks in 2017? There is a lot to look forward to in 2017. We will be releasing three vacuum measurement gauges this year that we have been working on for some time. They are the culmination of a lot of thought and effort on our part. It will be good to start getting customer feedback and helping customers to better meet their needs. For more information about Fredericks, contact us today. If you are interested in guest blogging opportunities, contact Shawn Orr at 215.938.4422.